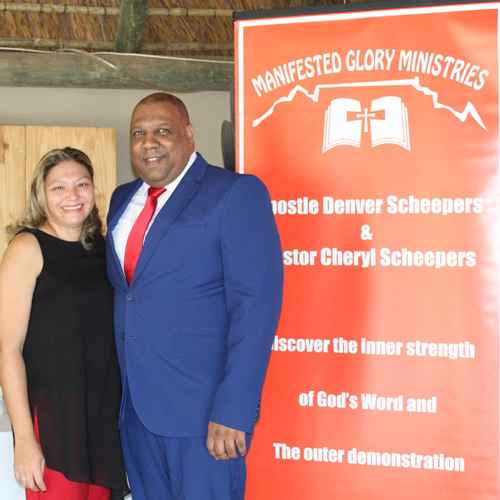 Apostle Denver and Pastor Cheryl got married in 1995 and have got three children : Debin, Faith and Gabriel. They got saved/born again in 1998 and immediately started serving as cell group leaders at their local church. In 2000 they attended a marriage enrichment course weekend and was prophesied over that their marriage will be a light house to many couples. They attended the Married for Life course and over the next two years trained as leaders. Through the years they presented many courses that improved hundreds of marriages. They trained as Pastors leading the family ministry and trained leaders as pre-marital counselors, marriage counselors, parenting counselors, general counseling among others. Apostle Denver prayed and laid hands on thousands of people of which thousands got healed from migraines, cancer, alcoholism, growth in legs and arms and all kinds of sickness and diseases. 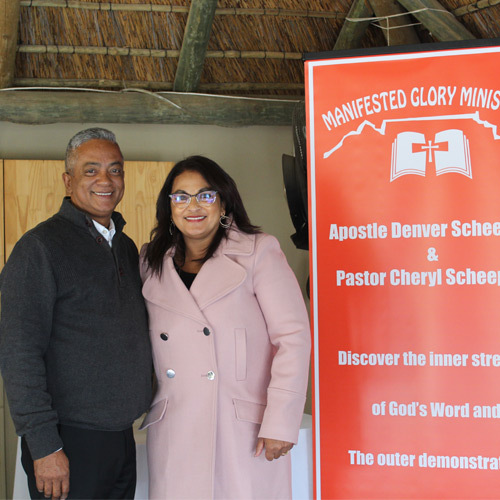 They started Manifested Glory Ministries with founding Elders, Greg and Gaye Petersen on 3 April 2016 at Eversdal, Durbanville. Our Lead Apostle and Lead Elder came together and decided to proceed with the ministry and thus, on 3 April 2016, the 1st service of Manifested Glory Ministries (with a few families) occurred. Apostle Denver teaches and preaches the uncompromised Word of God with signs and wonders following. Sitting under the teachings all members started experiencing miracles in their lives : spiritually, physically and financially. him. He now gave 20% share of the business to the church as he was instructed by the Holy Spirit. Since doing this step of faith God took the business from the brink of closure to a flourishing business that is on its way to full recovery! God is revealing that Cape Town will be blessed with a great move of God – a Revival that will produce a great spiritual awakening in Cape Town and will spread to the rest of the world. The church feels led to distribute 1 Million Bibles in Cape Town and each Bible represents a soul that will be saved for the Kingdom of God.